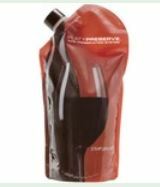 The best method I have found to keep opened wine from oxidizing (other than using argon), is using a wine bag such a the Platypreserve. My experience with this product has been uneven. Maybe some error on my part. Needs more work on my part to find the problem.